Syracuse University Associate Professor of English Mike Goode challenges the conventional accounts of the development of modern historical thought in his book “Sentimental Masculinity and the Rise of History, 1790-1890” (Cambridge University Press, 2009), which was reissued as a paperback in January. 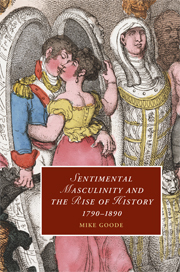 Goode, who is based in The College of Arts and Sciences, argues that in Romantic and Victorian Britain, struggles over historical authority were as much disputes over the nature of proper masculinity as they were contests over ideas and interpretations. “Cambridge does not—as a matter of policy—publish first books in paperback form until they have demonstrated their viability in expensive hardback editions, so this is both an honor and something that should give the book much broader currency,” Goode says. In his book, Goode uses texts by Edmund Burke, Thomas Paine, Walter Scott, Jane Austen, Thomas Rowlandson and various historians to chart the emergence of a feelings-based historical epistemology in the 19th century. Goode uncovers a Romantic historical tradition—one most influentially realized by historical novels—which held that historians must be manly and sentimental in order to understand history properly. He shows how by later in the 19th century, the bodies and feelings—but not the gender—of historians came to be regarded as irrelevant to their scholarly projects. The result is an unconventional account of the rise of history, one that focuses more on novelists, political philosophers and caricaturists than on historians. “Sentimental Masculinity and the Rise of History, 1790-1890” is part of the Cambridge Studies in Romanticism series, which offers critical studies devoted to literature in English from the early 1780s to the early 1830s. Goode, who earned an A.B. in economics at Princeton University and an M.A. and Ph.D. in English literature at the University of Chicago, specializes in late 18th- and early 19th-century British literature and culture, with an emphasis on the novel, poetry, intellectual history, gender and visual satire. He is the author of many journal articles and conference papers, and has lectured extensively in the United States and the United Kingdom.